Stretch Tents for Sale Dubai UAE, Techno Tents have earned a global reputation for manufacturing tents and tent accessories over the years in tent industry. Our mission is to keep revolutionizing, and stay at the forefront of the international stage with the next generation of stretch tents. 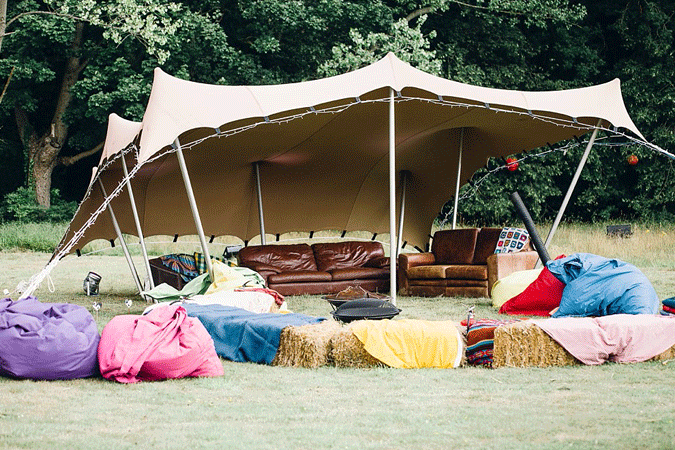 Stretch tents are a stylish, atmospheric and look great, a popular choice for event tents. The organic and curved shapes blend into and compliment outdoor venues and sceneries. 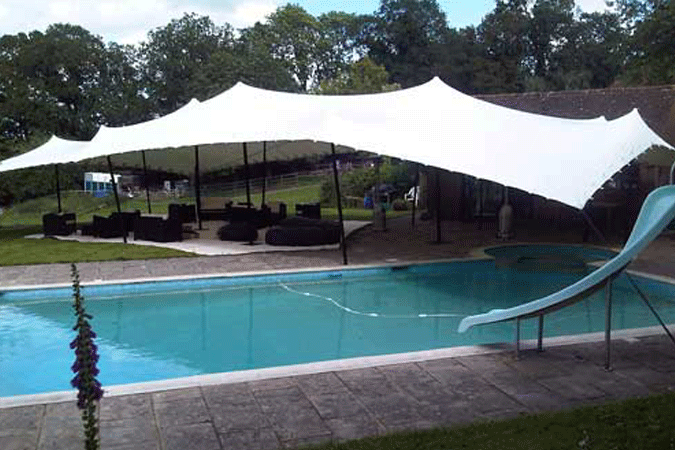 Explore the interesting lighting and decor options that come with such unique tent shaping to create an impressive, modern and welcoming atmosphere at any event.Stretch Tents all fabric remains waterproof while stretched with added Teflon coating to increase water resistance and advanced seaming technology guarantees drip free seams. Stretch tent fabric is treated with antimicrobials which inhibit mould and fungal growth. This is especially important in wet climates where tents cannot be dried quickly. 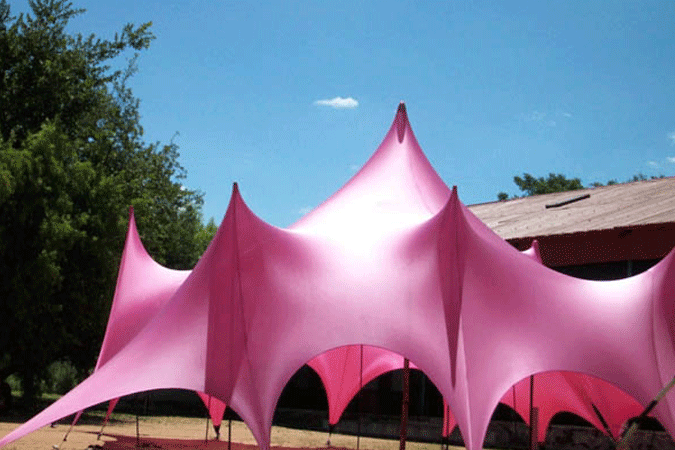 Techno Tents stretch tent fabric is coated and treated with dirt repellents to ensure it remains clean and stain free. This ensures it is easy to keep your tents in top quality condition. 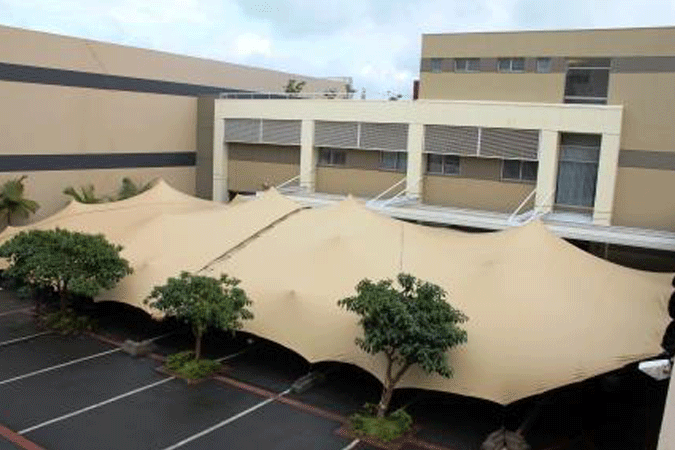 Our stretch tent fabric is fire resistant and complies with fire safety regulations. All custom colors are available in stretch tents. Techno Tents are the leading suplliers of Beach Tents for Sale worldwide. With the obvious exception of their fabulous looks, by far and away the best thing about Stretch Tents is their flexibility. 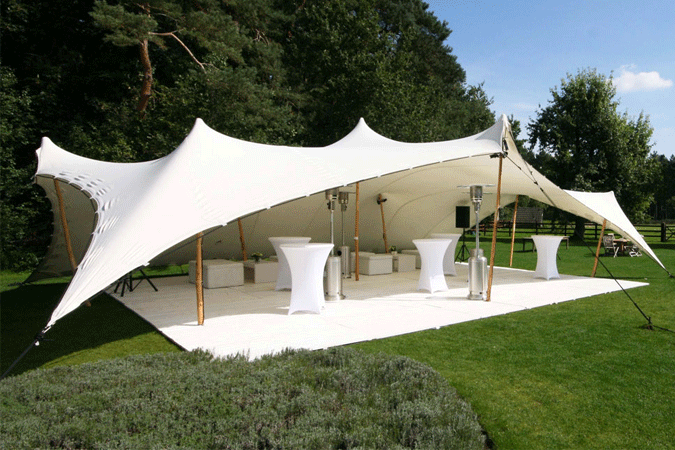 Stretch Tents open up spaces for entertaining that other marquees simply cannot get near, meaning that you can have your party, wedding, or event almost anywhere you would like it. 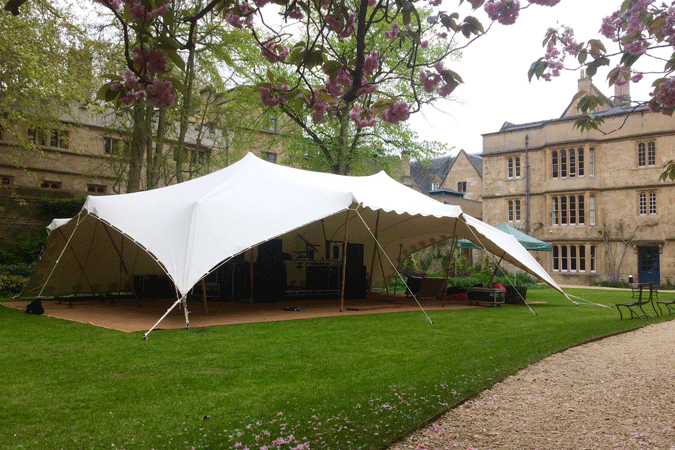 Stretch Tents can be set up on all surfaces, making light work of split level landscaping, uneven ground, water features, natural vegetation or awkward shaped spaces around buildings. They give you new possibilities to entertain and provide shelter in areas you have not thought of before. 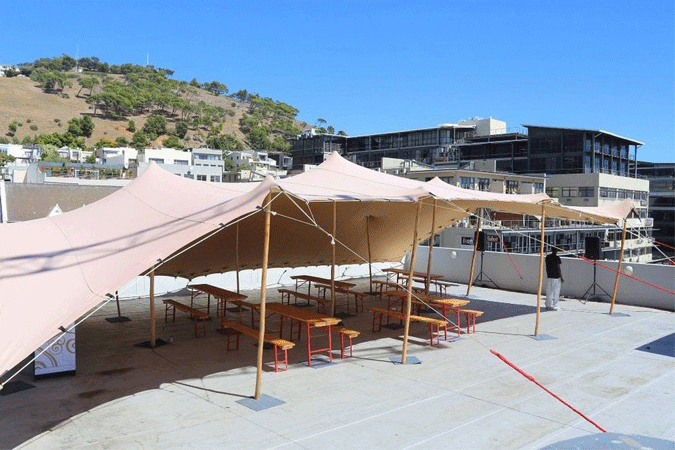 Bedouin Stretch Tents Manufacturers & Suppliers Worldwide, When you make the decision to buying a stretch tents from Techno Tents you are literally investing in the future. This is because our semi permanent stretch tents help to eliminate the need for sourcing additional event space each and every time you require. But they are very cost effective and safe. 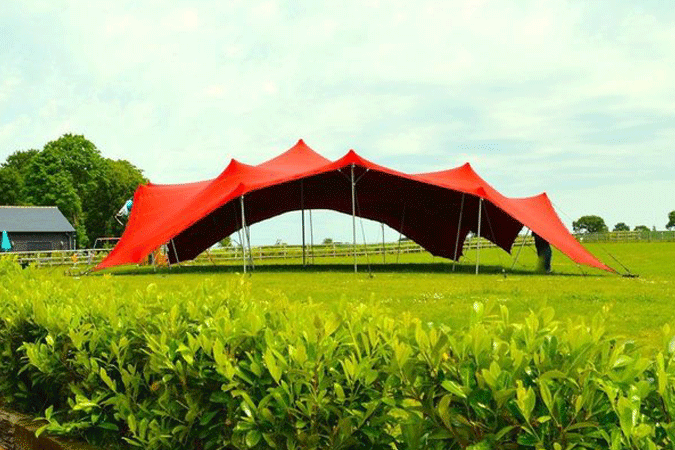 Techno tents supply worldwide countries like Saudi Arabia, Riyadh, Kuwait, Kuwait City, Qatar, Doha, United Arab Emirates, Abu Dhabi, United States, Washington DC, San Marino, San Marino, Switzerland, Zurich, Geneva, Ireland, Dublin, Brunei, Bandar Seri Begawan, Singapore, Pulau Ujong, China, Beijing, Hong Kong, Shanghai, Guangzhou, England, Birmingham, London, Manchester United Kingdom, Germany, Berlin, Norway, Oslo, Russia, Moscow, Sweden, Stockholm, Australia, Sydney, Adelaide, Melbourne, Perth, Canberra, Brisbane, Newcastle, Gold Coast, New Zealand, Auckland, Christchurch, Dunedin, Queenstown, Mauritius, Port Louis, Seychelles, Victoria, France, Paris, Netherlands, Amsterdam, Italy, Rome, Belgium, Brussels, Austria, Vienna, Spain, Barcelona, Madrid, Denmark, Copenhagen, Afghanistan, Albania, Algeria, Andorra, Angola, Argentina, Armenia, Aruba, Bahamas, Bahrain, Bangladesh, Barbados, Benin, Bhutan, Bolivia, Bosnia and Herzegovina, Botswana, Brazil, Bulgaria, Burkina Faso, Burma, Burundi Cambodia, Cameroon, Canada, Chile, Colombia, Comoros, Congo, Cyprus, Djibouti, Egypt, Ethiopia, Fiji, Finland, Gabon, Gambia, Ghana, Greece, Hungary, Iceland, India, Iran, Iraq, Israel, Jamaica, Japan, Jordan, Kenya, Lesotho, Liberia, Libya, Macau, Madagascar, Malawi, Malaysia, Maldives, Mali, Mexico, Monaco, Morocco, Mozambique, Namibia, Nepal, Niger, Nigeria, North Korea, Oman, Pakistan, Paraguay, Peru, Philippines, Portugal, Romania, Rwanda, Sierra Leone, South Africa, Sri Lanka, Sudan, Swaziland, Syria, Tanzania, Thailand, Togo, Tonga, Tunisia, Turkey, Uganda, Ukraine, Uruguay, Uzbekistan, Venezuela, Vietnam, Yemen, Zambia, Zimbabwe.